My family loves anything with blueberries, fresh or dried. They get their color from anthocyanin, an antioxidant, that can help increase circulation and decrease high blood pressure. Conventional blueberries can be high in pesticides so it may be wise to pay a little extra money for wild or organic. I think you’ll love the slight tang from the lemon and there’s certainly no loss in flavor by using coconut sugar and maple syrup instead of white or brown sugar. In a large bowl, whisk the maple syrup, lemon juice and corn starch. Add the blueberries and lemon zest; and mix until combined. In a medium sized bowl, add the GF pancake and waffle mix, coconut sugar, rolled oats and vegan butter. Using your hands, combine until the butter is the size of small peas and then add half of the sliced almonds. 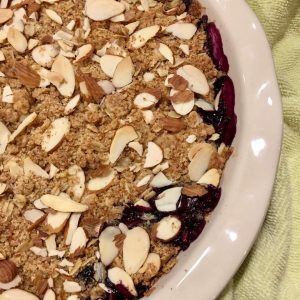 Pour the blueberry filling into a deep pie dish or an 8 x 8″ baking pan. Spread the crumble topping evening over the fruit. Top with the remaining almonds. Bake until the filling is bubbly around the edges, about 45 minutes. * I prefer the Trader Joe’s brand because it feels like wheat flour and it is not grainy.